Wilcannia-Forbes Diocese invites everyone to see first-hand the many good things happening in their 18 parish schools during Catholic Schools Week during 3 – 10 March 2019. ‘Seeking the True, the Beautiful and the Good’ is the theme for this year’s Catholic Schools Week, and Director of Mission and Religious Education, Dr Gerard O’Shea, explains the meaning behind the tagline. “Any sound education must pay close attention to the needs of the person being educated. Since the time of Plato and Aristotle, the consensus about the deepest desire of the human heart – the search for the True, the Beautiful and the Good. The integrated pursuit of truth, beauty and goodness underpins everything of value that our school system offers,” Dr O’Shea said. Dr O’Shea said that those who work in Catholic schools, whether or not they belong to the Catholic faith, share this perspective in virtue of their common humanity. The search for the True, the Beautiful and the Good, is the fundamental desire inscribed in every human heart,” he said. Wilcannia-Forbes Catholic School Leaders travelled to Forbes for a Principals Conference on 29, 30 & 31 May 2018. Three new Principals were warmly welcomed to the group, Jessica Armitage, Principal of St Mary’s Hay, Regina Goodridge, Principal of St Joseph’s Peak Hill and Bill Mulcahy, Principal of St Patrick’s Brewarrina. Former principal of St Mary’s Hay, Nick Baird, has also been welcomed to Holy Family Parkes as has former principal of St Patrick’s Brewarrina, Sharon Ferrari, who has relocated to St John’s Trangie. A highlight of the conference was the commissioning of all Wilcannia-Forbes Principals. 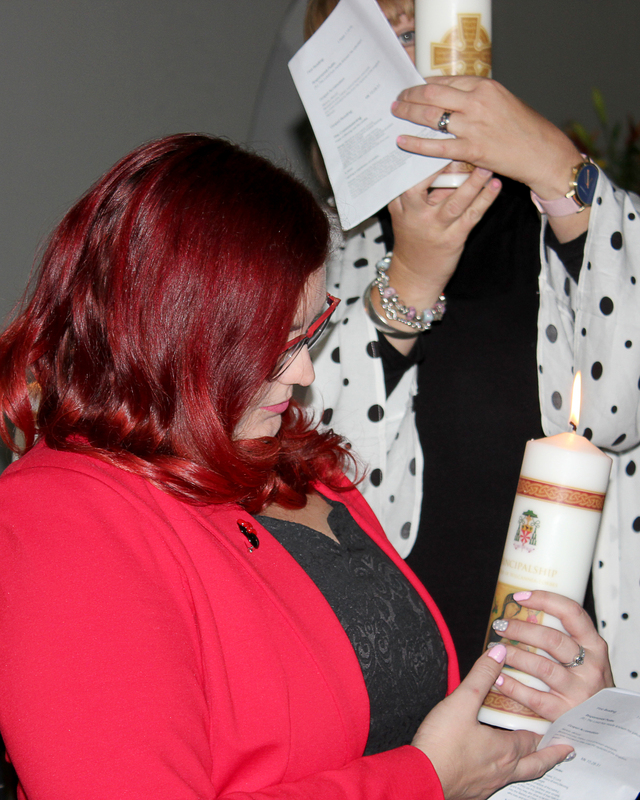 During a special Mass held on Tuesday night, Bishop Columba Macbeth-Green inducted the group of 18 Principals, before giving them his blessing and presenting each principal with a principalship candle. The Deputy Director of Catholic Education, Mrs Mary-Ellen Dempsey, couldn’t be prouder of the teaching strategies being put in place in Wilcannia-Forbes classrooms. “I am very impressed by the level that Principals have embraced the professional learning on “Quality Instruction Practices,’ delivered by world renowned educator Dr Lyn Sharratt. During their presentations, principal’s highlighted evidence of implementation and evidence of impact on both student outcomes and teacher development.,” Mrs Dempsey said. Mr Gordon said the dedication of Wilcannia-Forbes Principals’ is of a very high standard. “Our Principals are leaders who are able to ensure that all of our teachers and staff share leadership responsibility in providing the best, evidence-based approaches to the teaching of their students,” he said. “Our Principals’ care and love for their school communities was on display in their showcase presentations. There was also a sense of inspiration and excitement as we listened to the different ways that teachers are using evidence-based approaches to meet the local needs of students across the Diocese, “Mr Gordon said. “The professional learning for teachers and leaders in the Diocese of Wilcannia-Forbes is outstanding and its effect can be seen in every classroom in every school,” Mr Gordon concluded. Most Rev Columba Macbeth-Green OSPPE, Bishop of Wilcannia-Forbes, is pleased to announce the appointment of Mr Anthony Gordon to Director of Catholic Education in the Diocese, and warmly welcomed Mr Gordon to the Catholic Education Office on Monday. Since 2011, Anthony has held the role of Learning Leader: Mission, Catholic Education in the Diocese of Parramatta. Prior to this Anthony has fulfilled leadership roles in Sydney Catholic Schools as Archdiocesan Youth Ministry Coordinator and Faith Formation and Evangelisation Advisor. He has also worked as a Senior Lecturer in Philosophy and Theology and as Chaplaincy Convenor at the University of Notre Dame Australia. Anthony has experience as a classroom teacher and Religious Education Coordinator. He holds the qualifications of Bachelor of Arts (Honours) Graduate Diploma of Education and Masters of Religious Education. The recruitment process to appoint a new Director of Catholic Education was supported by Reach Human Resources and Mr Gordon was selected from a strong field with advice from a selection committee that included Rev Don Gunn, a parent representative and other leading professionals. “Anthony’s experience in Catholic Education Leadership and his strong family values will position Mr Gordon well in dealing with the challenges of our vast diocese,” Bishop Columba said. Mr Gordon will be replacing Mrs Mary-Ellen Dempsey who has held the position of Acting Director of Catholic Education since April 2017. Mary-Ellen will be returning to her position of Deputy Director of Catholic Education for the Diocese of Wilcannia-Forbes. “Mary-Ellen’s leadership of Education reflected the very heart of her ministry. Mary-Ellen has been, for us all, a pillar of strength in challenging and changing times,” Bishop Columba said.